The UsuryFree Eye Opener: Germany's Local Currencies - Economic Cure or Fool's Gold? Germany's Local Currencies - Economic Cure or Fool's Gold? 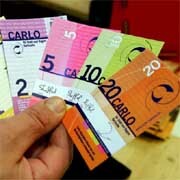 The "Carlo" is just one of Germany's many regional currencies. How many currencies does Germany have? More than one, it turns out. In an effort to boost their local economies, 22 regions in the country have introduced their own alternative tender -- but are they worth the paper they're printed on? At some point in the spring of 2004, the money ran out in the village of Güsen in the eastern German state of Saxony-Anhalt. At least, Frank Jansky wasn't receiving any. "People couldn't pay their bills anymore," says Jansky, who runs a lawyer's office in Güsen, where he represents mainly tradesmen and small construction firms. Around that time, Jansky heard about regional currencies and thought: "That's it." His idea: Instead of using euros, eastern Germany's increasingly pauperized population ought to be able to pay in goods and services. The regional currency would be known as the "Urstromtaler" (the name is a play on words, combining "Urstromtal," the name of a Saxony-Anhalt valley, with "taler," the name of an old German currency -- which incidentally also inspired the name "dollar"). A network of tradesmen, fortune tellers, herbal experts and ecological specialists had formed in and around Madgeburg by early October, 2004 -- and they were ready for currency reform. Jansky's co-operative opted out of the euro on the anniversary of Germany's reunification, October 3. Annika Pietsch, who had been up until then just an employee in Jansky's office, became the director of the new central bank -- which takes the form of a small blue cash box she carries around with her. She prints the bills, which feature an ocher-colored map of Saxony-Anhalt, in her apartment. They can't be counterfeited, she says -- she's tried it herself to be sure. Pietsch exchanges the euros the locals bring her for Urstromtaler and grants members Urstromtaler credits. Her job as a one-woman central bank is also remunerated in Urstromtaler, which she can use as tender when purchasing goods and services from any of the association's 165 members. The system works like this. Pietsch uses Urstromtaler to pay for her purchases at, say, the health food shop. Its owners then use the same bills to pay the local cheese-makers, who pass those same bills along to the carpenter who repaired their goat stable. The ideal scenario is that a closed loop develops, boosting the regional economy and preventing money from being drained from the area. Twenty-two such regional currencies are already in use in Germany, and 31 more are in preparation. They're called "Kann Was" ("Can Do"), "Nahgold" ("Near Gold"), "Carlo" or "Volmetaler" -- and their transactions are eligible for tax just like euros. Frank Jansky -- who also directs Regiogeld, the umbrella association for the currencies -- was even recently visited by a BBC reporter who asked him to explain Germany's wondrous proliferation of currencies. The "Chiemgauer" currency (named for the Bavarian region of Chiemgau) is the most successful to date. The project was started by Christian Gelleri, a Waldorf school teacher, and six of his students in Bavaria in 2002. The regional currency's annual turnover climbed to an impressive €1.5 million ($2 million) last year. About 90,000 Chiemgauers are currently in circulation. Unlike the Urstromtalers, they can be converted back into euro for a fee. "Our currency circulates three times more rapidly than the euro," says Gelleri. But in order to achieve this, the system puts pressures on currency holders to spend: The Chiemgauer loses two percent of its value every three months and has to be "topped up" by purchasing a coupon. The idea for a so-called "depreciative currency" was pioneered by Silvio Gesell, a German merchant and social reformer. Gesell witnessed a serious economic crisis in Argentina at the end of the 19th century. He explained it in terms of excessive hoarding and insufficient monetary circulation. His solution was to make money perishable like other commodities -- bank notes, he believed, should "rust." Regional currencies prevent money from being drained from the area where the currency is in use and transfered to booming regions like China or India, says Margrit Kennedy, the author of several books on alternative currencies. "Regional money is like a homeopathic cure for the chaos and suffering international financial markets cause in the world," Kennedy says. Gerhard Rösl, a political economist at Regensburg Technical College, is not convinced. "Social romanticism on the part of people who don't think in a structured way" is how he characterizes this way of thinking. Rösl has carried out a study on regional currencies for Germany's central bank. The basic thrust of his study is that regional money may be an entertaining gimmick for tourists, but it's largely nonsense from an economic point of view. Regional currencies are only helpful in the context of a generalized deflation, when shrinking liquidity needs to be compensated for, Rösl says. That was the case in the Austrian town of Wörgl in 1932, for example, when the township successfully issued a local currency or scrip. Admittedly it's also the case today in the region where the Urstromtaler is circulating, where people are gradually running out of euros. In Chiemgau, on the other hand, the initial impulse for the new currency came from wealthy parents who exchanged €200 ($263) a month for Chiemgauers in order to get their childrens' school project started. The alternative tender remains a luxury currency. What with the "topping up" charge, the reconversion fee and the costs of inflation, Chiemgauer holders are effectively paying a surcharge of 15 percent on every Chiemgauer -- which translates into risk-free gross income for Gelleri's bank. Some of this money is placed by Gelleri into a savings account in a bank -- which isn't quite in the spirit of his experiment. "It's then that alarm bells should start ringing in people's head," says Rösl, who describes it as a "snowball system." The last one in line always pays more, he says. In the meantime, Gelleri has quit his job as a teacher. The Chiemgauer fees are rolling in so reliably that he's decided to make being treasurer his main occupation. He himself admits that every single goal the Chiemgauer is meant to achieve -- stimulating regional associations and the local economy -- could just as well be achieved with the euro. Meanwhile, in the German city of Giessen, Winrich Prenk is closing down the "Justus" project. The engineer invested more than €4,000 ($5,253) in the currency, but somehow the money refused to circulate. Now he says he's forced to go around "collecting the play money again." In reality, the Justus was just too expensive. "Regional currencies always costs a fortune," he says. NOTE: My humble opinion after promoting the usuryfree community currency movement for more than 30 years, I recommend the usuryfree time currency model as the optimal alternative currency for this 21st century. There was "Life Without Usury" and there will be "Life Without Usury" again. It's The Usury, Stupid !! Global Move Your Money Week!